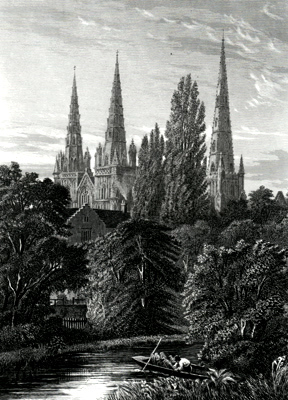 CHASE, John, 1810-1879 : LICHFIELD CATHEDRAL. [London] : Cassell, Petter & Galpin, . An stylish antique print – a view from the river, Lichfield Cathedral rising above the trees. Engraved by Charles George Lewis (1808-1880) from an original study by John Chase. Originally produced for the partwork publication “Our Own Country” (1879-1883). Steel line engraving on paper. Engraved surface 214 x 148mm (approx. 8-3/8” x 5-3/4”). A few tiny specks, but overall in very good and clean state. A guaranteed genuine antique print. COX, David, 1783-1859 : THE RAILWAY NEAR PENKRIDGE, TEDDESLEY HALL IN THE DISTANCE. [London : William S. Orr & Co., 1856]. A pleasant antique print – two labourers and a dog sit by the newly laid railway and gaze down at river, bridge and cottages – sheep in the meadow. 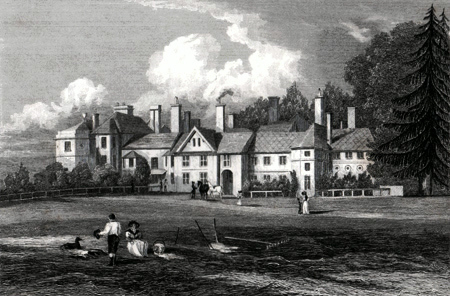 Engraved by William Radclyffe (1783-1855) from an original study by David Cox. 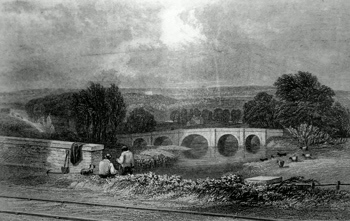 Originally produced for Thomas Roscoe’s “Book of the Grand Junction Railway” (London : 1839) – and here in a slightly later impression from a lithographic transfer. Lithograph on paper. Engraved surface 106 x 151mm (approx. 4-1/4” x 5-7/8”). In very good and clean state. A guaranteed genuine antique print. [London : William S. Orr & Co., 1856]. 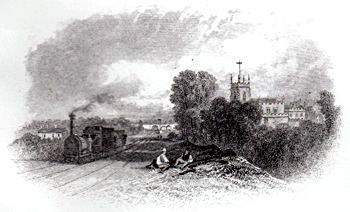 A charming small antique print – an oval vignette giving a view of a railway train steaming past the town – the church tower and the bridge prominent in the distance. 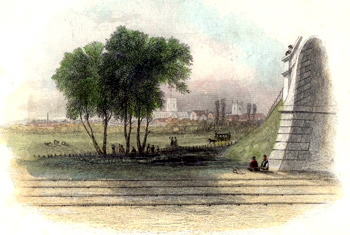 Originally produced for Thomas Roscoe’s “Book of the Grand Junction Railway” (London : 1839) – and here in a slightly later impression from a lithographic transfer. Lithograph on paper. Engraved surface 66 x 101mm (approx. 2-5/8” x 4”). In very good and clean state. A guaranteed genuine antique print. [London : C. Tilt, 1839]. A charming small antique print – an oval vignette giving a view of the town from the newly laid railway lines and bridge. Originally produced for Thomas Roscoe’s “Book of the Grand Junction Railway” (London : 1839). Steel line engraving on paper. Later hand colour. Engraved surface 85 x 105mm (approx. 3-3/8” x 4-1/8”). In very good and clean state. A guaranteed genuine antique print. [ENGLISH SCHOOL] : TAMWORTH CHURCH. [London : ca.1850]. 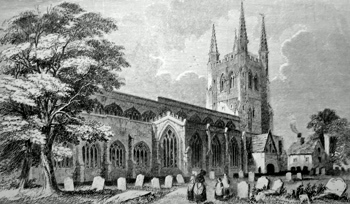 A pleasant antique print – the ancient parish church of St. Editha at Tamworth – with its pinnacled tower. English school. Mid nineteenth century. Wood engraving on paper. Engraved surface 124 x 212mm (approx. 4-7/8” x 8-3/8”). Trimmed very close to neatlines, but otherwise in very good and clean state. A guaranteed genuine antique print. [HULME, Frederick William, 1816-1884] : 2. – BURSLEM AND LONGPORT. [London : William S. Orr & Co., 1856]. A charming oval vignette antique print – a distant prospect of Burslem – the canal in the foreground – the distinctive chimneys of the potteries beyond. Engraved by Mason Jackson (1819-1903) from an original study by Frederick William Hulme. Originally produced in 1850 for the part-work publication “The Land We Live In” (London : 1847-1851) – and here in a slightly later impression. Wood engraving on paper. Engraved surface 131 x 185mm (approx. 5-1/4” x 7-1/4”). In very good and clean state. A guaranteed genuine antique print. HULME, Frederick William, 1816-1884 : 8. – BIDDULPH HALL. [London : William S. Orr & Co., 1856]. 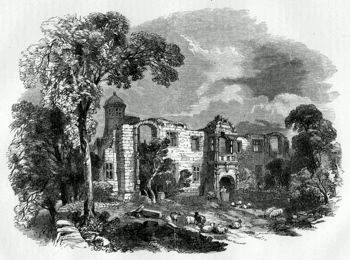 An attractive antique print – an oval vignette view of the ruined shell of old Biddulph Hall. Engraved by George and Edward Dalziel from an original study by Frederick William Hulme. Originally produced for the part-work publication “The Land We Live In” (London : 1847-1851) – and here in a slightly later impression. Wood engraving on paper. Engraved surface 136 x 186mm (approx. 5-3/8” x 7-3/8”). In very good and clean state. A guaranteed genuine antique print. HULME, Frederick William, 1816-1884 : 9. – TRENTHAM HALL. [London : William S. Orr & Co., 1856]. 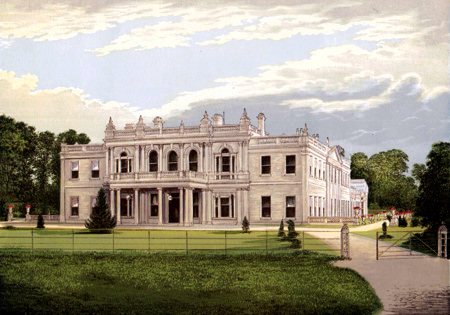 An attractive antique print – an elegant view of the nineteenth-century Trentham Hall. Engraved by Thomas Williams (fl.1828-1862) from an original study by Frederick William Hulme. Originally produced for the part-work publication “The Land We Live In” (London : 1847-1851) – and here in a slightly later impression. Wood engraving on paper. Engraved surface 136 x 189mm (approx. 5-3/8” x 7-1/2”). In very good and clean state. A guaranteed genuine antique print. [HULME, Frederick William, 1816-1884] : THE POTTERIES. FROM BASFORD. [London : William S. Orr & Co., 1856]. A charming antique print – a view from an eminence across the railway and the viaduct to the Potteries. Engraved by Thomas Abiel Prior (1809-1866) from an original study by Frederick William Hulme. Originally produced for the part-work publication “The Land We Live In” (London : 1847-1851) and here in a slightly later impression. Steel line engraving on paper. Engraved surface 150 x 196mm (approx. 5-7/8” x 7-3/4”). In very good and clean state. A guaranteed genuine antique print. KEENE, William Caxton, 1855-1910 : BEAUDESERT. [London : Cassell & Co., 1883]. 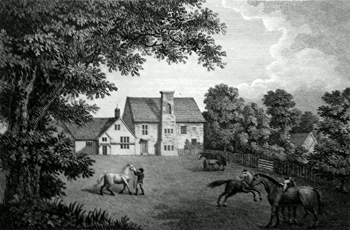 An attractive antique print – the great house at Beaudesert to the south of Rugeley. Engraved from an original study by William Caxton Keene and originally produced for the partwork publication “Our Own Country” (London : 1879-1883). Wood engraving on paper. Engraved surface 129 x 201mm (approx. 5-1/8” x 7-7/8”). In very good and clean state. A guaranteed genuine antique print. [LYDON, Frank (Alexander Francis), 1836-1917] : ALTON TOWERS. [London : W. Mackenzie, 1880]. 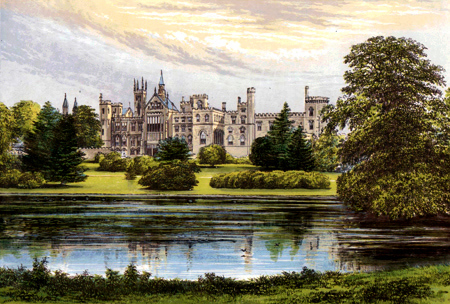 A handsome antique print – the gothic revival mansion built by the Earls of Shrewsbury – a view across the water. A technically highly accomplished production, colour printed in eight or more overlays from separate wooden blocks by Benjamin Fawcett (1808-1893) from original draughts (drawn on the wood) by Frank Lydon. Originally produced for the Francis Orpen Morris part-work “County Seats of the Noblemen and Gentlemen of Great Britain and Ireland” (1864-1880). Multiple wood block engraving in colours (chromoxylograph). Engraved surface 128 x 189mm (approx. 5” x 7-1/2”). A few tiny specks, but overall in very good and clean state. A guaranteed genuine antique print. [LYDON, Frank (Alexander Francis), 1836-1917] : ASHCOMBE PARK. [London : William Mackenzie, 1880]. 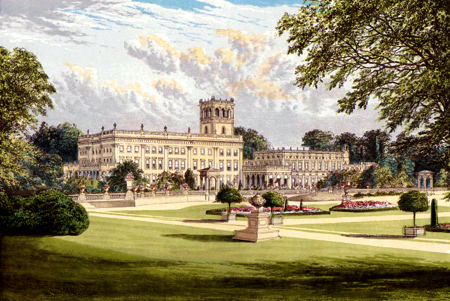 An attractive antique print of the early nineteenth-century Ashcombe Park at Cheddleton – a view from the grounds. A technically highly accomplished production, colour printed in eight or more overlays from separate wooden blocks by Benjamin Fawcett (1808-1893) from original draughts (drawn on the wood) by Frank Lydon. Originally produced for the Francis Orpen Morris part-work “County Seats of the Noblemen and Gentlemen of Great Britain and Ireland” (1864-1880). Multiple wood block engraving in colours (chromoxylograph). Engraved surface 131 x 186mm (approx. 5-1/8” x 7-3/8”). A few tiny specks, but overall in very good and clean state. A guaranteed genuine antique print. [LYDON, Frank (Alexander Francis), 1836-1917] : BEAUDESERT. [London : W. Mackenzie, 1880]. An attractive antique print – the great house at Beaudesert to the south of Rugeley – at this time the home of the Marquis of Anglesey. A technically highly accomplished production, colour printed in eight or more overlays from separate wooden blocks by Benjamin Fawcett (1808-1893) from original draughts (drawn on the wood) by Frank Lydon. Originally produced for the Francis Orpen Morris part-work “County Seats of the Noblemen and Gentlemen of Great Britain and Ireland” (1864-1880). Multiple wood block engraving in colours (chromoxylograph). Engraved surface 131 x 190mm (approx. 5-1/8” x 7-1/2”). A few tiny specks, but overall in very good and clean state. A guaranteed genuine antique print. [LYDON, Frank (Alexander Francis), 1836-1917] : KEELE HALL. [London : W. Mackenzie, 1880]. 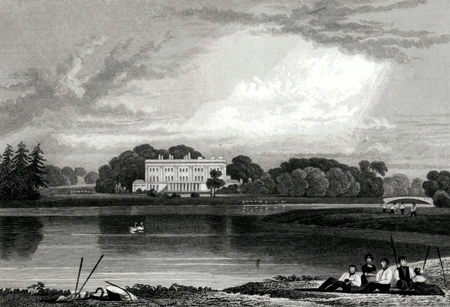 A hndsome antique print of Keele Hall as rebuilt by Anthony Salvin in the mid-nineteenth century – a view from the water. A technically highly accomplished production, colour printed in eight or more overlays from separate wooden blocks by Benjamin Fawcett (1808-1893) from original draughts (drawn on the wood) by Frank Lydon. Originally produced for the Francis Orpen Morris part-work “County Seats of the Noblemen and Gentlemen of Great Britain and Ireland” (1864-1880). Multiple wood block engraving in colours (chromoxylograph). Engraved surface 133 x 187mm (approx. 5-1/4” x 7-3/8”). A few tiny specks, but overall in very good and clean state. A guaranteed genuine antique print. [LYDON, Frank (Alexander Francis), 1836-1917] : OXLEY MANOR. [London : William Mackenzie, 1880]. 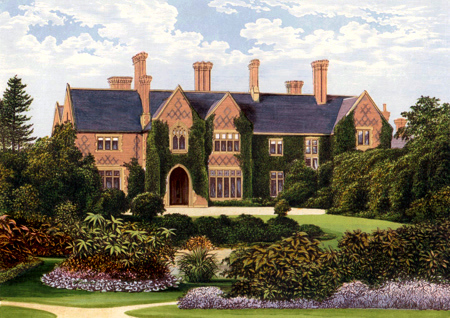 A handsome antique print – Oxley Manor near Wolverhampton, home of the Staveley-Hill family, but demolished in 1929. A technically highly accomplished production, colour printed in eight or more overlays from separate wooden blocks by Benjamin Fawcett (1808-1893) from original draughts (drawn on the wood) by Frank Lydon. Originally produced for the Francis Orpen Morris part-work “County Seats of the Noblemen and Gentlemen of Great Britain and Ireland” (1864-1880). Multiple wood block engraving in colours (chromoxylograph). Engraved surface 133 x 186mm (approx. 5-1/4” x 7-3/8”). A few tiny specks, but overall in very good and clean state. A guaranteed genuine antique print. LYDON, Frank (Alexander Francis), 1836-1917 : ROLLESTON HALL. [London : William Mackenzie, 1880]. 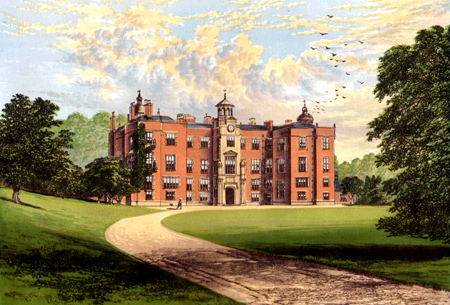 An attractive antique print of the now-lost Rolleston Hall near Burton-on-Trent, surviving only in part. A technically highly accomplished production, colour printed in eight or more overlays from separate wooden blocks by Benjamin Fawcett (1808-1893) from original draughts (drawn on the wood) by Frank Lydon. Originally produced for the Francis Orpen Morris part-work “County Seats of the Noblemen and Gentlemen of Great Britain and Ireland” (1864-1880). Multiple wood block engraving in colours (chromoxylograph). Engraved surface 132 x 186mm (approx. 5-1/8” x 7-3/8”). A few tiny marks and specks to blank margins, but overall in very good and clean state. A guaranteed genuine antique print. [LYDON, Frank (Alexander Francis), 1836-1917] : TRENTHAM HALL. [London : W. Mackenzie, 1880]. 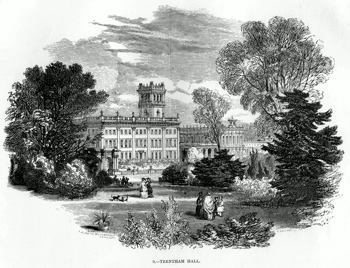 A charming antique print – a view of Trentham Hall from the fomal gardens. A technically highly accomplished production, colour printed in eight or more overlays from separate wooden blocks by Benjamin Fawcett (1808-1893) from original draughts (drawn on the wood) by Frank Lydon. Originally produced for the Francis Orpen Morris part-work “County Seats of the Noblemen and Gentlemen of Great Britain and Ireland” (1864-1880). Multiple wood block engraving in colours (chromoxylograph). Engraved surface 128 x 188mm (approx. 5” x 7-3/8”). A few tiny specks, but overall in very good and clean state. A guaranteed genuine antique print. [LYDON, Frank (Alexander Francis), 1836-1917] : WOLSELEY HALL. [London : William Mackenzie, 1880]. An attractive antique print of Wolseley Hall near Rugeley – the house from the lawn. A technically highly accomplished production, colour printed in eight or more overlays from separate wooden blocks by Benjamin Fawcett (1808-1893) from original draughts (drawn on the wood) by Frank Lydon. Originally produced for the Francis Orpen Morris part-work “County Seats of the Noblemen and Gentlemen of Great Britain and Ireland” (1864-1880). Multiple wood block engraving in colours (chromoxylograph). Engraved surface 131 x 186mm (approx. 5-1/8” x 7-1/4”). A few tiny specks, but overall in very good and clean state. A guaranteed genuine antique print. MASON, Abraham John, 1794- : 4. – ETRURIA HALL. [London : William S. Orr & Co., 1856]. A charming antique print – an oval vignette view of Etruria Hall, built for Josiah Wedgwood in the eighteenth century. 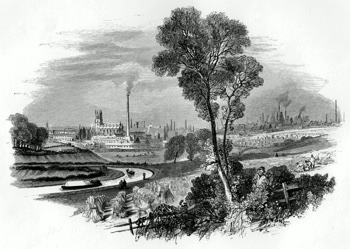 Engraved by Abraham John Mason and originally produced in 1850 for the part-work publication “The Land We Live In” (London : 1847-1851) – but here in a slightly later impression. Wood engraving on paper. Engraved surface 178 x 138mm (approx. 7” x 5-1/2”). In very good and clean state. A guaranteed genuine antique print. [NEALE, John Preston, 1780-1847] : ALTON ABBEY, STAFFORDSHIRE. [London : Jones & Co., 1830]. 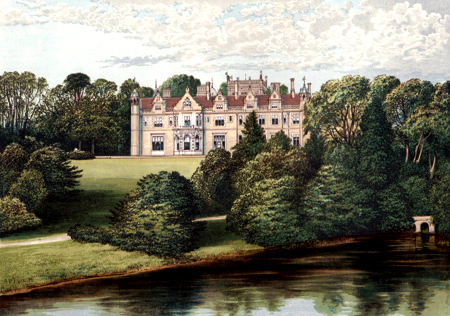 A pleasant antique print – the gothic revival mansion built by the Earls of Shrewsbury, later to become Alton Towers. Engraved by William Radclyffe (1783-1855) from an original study by John Preston Neale. Originally produced for the part-work “Views of the Seats, Mansions, Castles, etc. of Noblemen and Gentlemen in England” (London : 1829-1831). Line engraving on paper. Engraved surface 96 x 124mm (approx. 3-3/4” x 4-7/8”). In very good and clean state. A guaranteed genuine antique print. [NEALE, John Preston, 1780-1847] : BEAUDESERT PARK. STAFFORDSHIRE. [London : Jones & Co., 1831]. 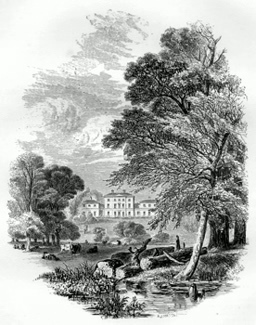 A pleasant antique print – the now-ruined great house at Beaudesert. Engraved by Frederick Rudolph Hay (fl.1807-1831) from an original study by John Preston Neale. Originally produced for the partwork series “Views of the Seats, Mansions, Castles, etc. of Noblemen and Gentlemen” (London : 1829-1831). Steel line engraving on paper. Engraved surface 98 x 127mm (approx. 3-7/8” x 5”). In very good and clean state. A guaranteed genuine antique print. [NEALE, John Preston, 1780-1847] : BISHTON HALL. STAFFORDSHIRE. [London : Jones & Co., 1831]. An attractive antique print – Bishton Hall near Wolseley Bridge – men fishing in the foreground. 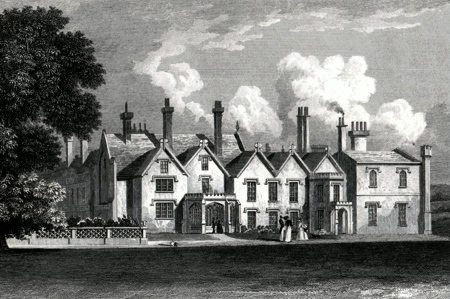 Engraved by John James Hinchliff (1805-1875) from an original study by John Preston Neale. Originally produced for the part-work “Views of the Seats, Mansions, Castles, etc. of Noblemen and Gentlemen” (London : 1829-1831). Steel line engraving on paper. Engraved surface 97 x 129mm (approx. 3-7/8” x 5-1/8”). In very good and clean state. A guaranteed genuine antique print. [NEALE, John Preston, 1780-1847] : BLITHEFIELD. STAFFORDSHIRE. [London : Jones & Co., 1831]. 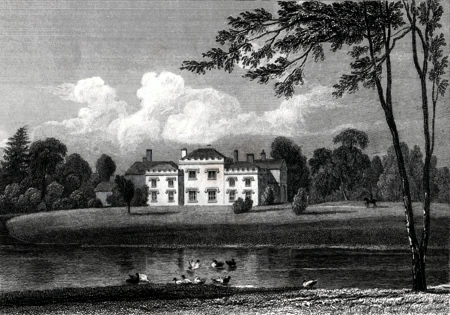 A pleasant antique print – a view of Blithefield or Blithfield Hall, north of Rugeley. Engraved by William Watkins (1807-1891) from an original study by John Preston Neale. Originally produced for the partwork series “Views of the Seats, Mansions, Castles, etc. of Noblemen and Gentlemen” (London : 1829-1831). Steel line engraving on paper. Engraved surface 96 x 127mm (approx. 3-3/4” x 5”). In very good and clean state. A guaranteed genuine antique print. NEALE, John Preston, 1780-1847 : HAGLEY HALL, STAFFORDSHIRE. London : Jones & Co., 1831. A pleasant antique print – a view from the hayfield of old Hagley Hall at Rugeley. Engraved by William Watkins (1807-1891) from an original study by John Preston Neale. Originally produced for the partwork series “Views of the Seats, Mansions, Castles, etc. of Noblemen and Gentlemen” (London : 1829-1831). NEALE, John Preston, 1780-1847 : [HAWKESYARD HALL] ARMITAGE PARK. STAFFORDSHIRE. London : Jones & Co., . A pleasant antique print – the delightful house near Rugeley variously known as Spode House, Armitage Park and currently Hawkesyard Hall. Engraved by Frederick Rudolph Hay (fl.1807-1831) from an original study by John Preston Neale. Originally produced for the partwork series “Views of the Seats, Mansions, Castles, etc. of Noblemen and Gentlemen” (London : 1829-1831). Steel line engraving on paper. Engraved surface 98 x 129mm (approx. 3-7/8” x 5-1/8”). In very good and clean state. A guaranteed genuine antique print. [NEALE, John Preston, 1780-1847] : [INGESTRE] INGESTRIE, STAFFORDSHIRE. [London : Jones & Co., ca.1831]. 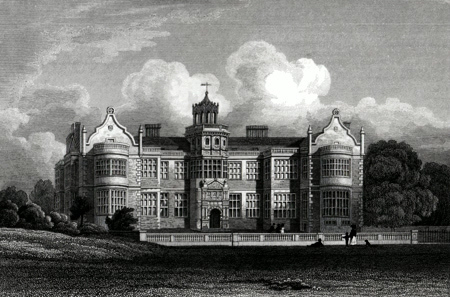 A pleasant antique print – the rose-coloured Jacobean Ingestre Hall near Stafford. 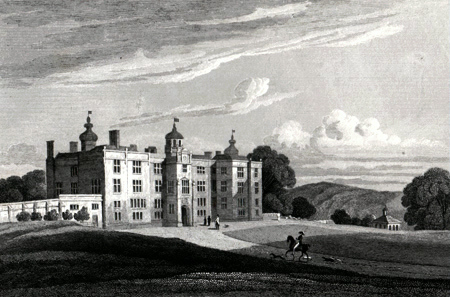 Engraved by Henry Winsor Bond (1804-1881) from a drawing by John Preston Neale. Originally produced for the part-work “Views of the Seats, Mansions, Castles, etc. of Noblemen and Gentlemen in England” (London : 1829-1831). Steel line engraving on paper. Engraved surface 99 x 128mm (approx. 3-7/8” x 5”). In very good and clean state. A guaranteed genuine antique print. NEALE, John Preston, 1780-1847 : MAPLE HAYES, STAFFORDSHIRE. [London : Jones & Co., 1831]. 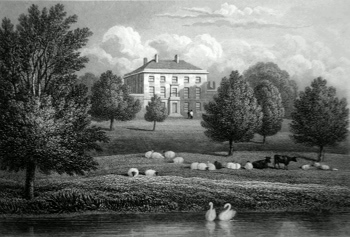 A charming antique print – Maple Hayes Hall at Lichfield – a view from the water – swans and sheep in the foreground. Engraved by Thomas Hosmer Shepherd (1793-1864) from an original study by John Preston Neale. Originally produced for the partwork series “Views of the Seats, Mansions, Castles, etc. of Noblemen and Gentlemen” (London : 1829-1831). Steel line engraving on paper. Engraved surface 98 x 126mm (approx. 3-7/8” x 5”). In very good and clean state. A guaranteed genuine antique print. 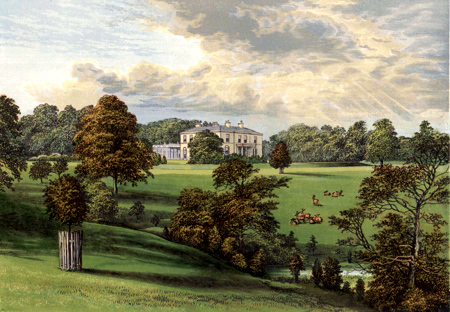 NEALE, John Preston, 1780-1847 : SHUGBOROUGH PARK. STAFFORDSHIRE. London : Jones & Co., 1831. 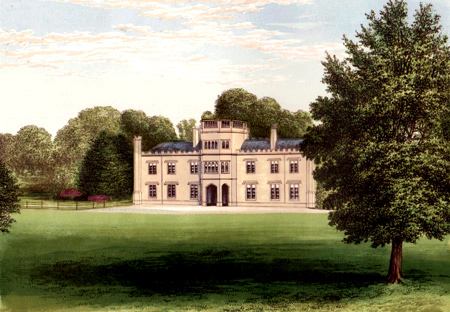 A handsome antique print – the great house from the grounds. 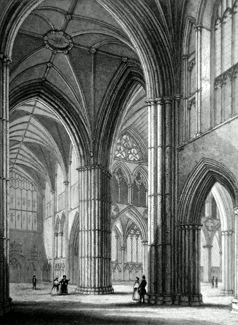 Engraved by John James Hinchliff (1805-1875) from an original study by John Preston Neale. Originally produced for the part-work “Views of the Seats, Mansions, Castles, etc. of Noblemen and Gentlemen” (London : 1829-1831). Steel line engraving on paper. Engraved surface 98 x 129mm (approx. 3-7/8” x 5-1/8”). Faint marking to lower margin, but overall in very good and clean state. A guaranteed genuine antique print. [NEALE, John Preston, 1780-1847] : TIXALL. STAFFORDSHIRE. [London : Jones & Co., 1831]. 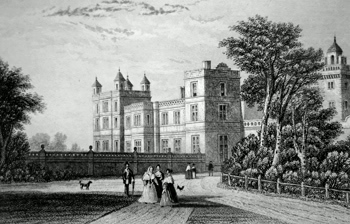 A charming antique print – a view from the water of the now demolished Tixhall Hall, with the still-standing Elizabethan gatehouse to the left. 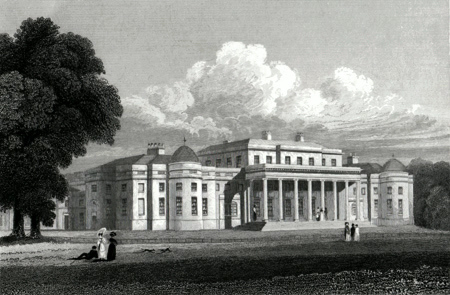 Engraved by Thomas Higham (1796-1844) from an original study by John Preston Neale. Originally produced for the partwork series “Views of the Seats, Mansions, Castles, etc. of Noblemen and Gentlemen” (London : 1829-1831). Steel line engraving on paper. Engraved surface 96 x 129mm (approx. 3-3/4” x 5-1/8”). In very good and clean state. A guaranteed genuine antique print. [NEALE, John Preston, 1780-1847] : TRENTHAM HALL. 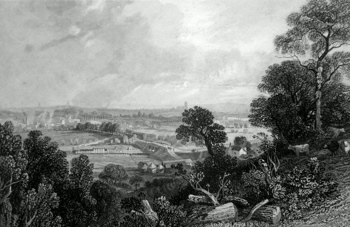 GENERAL VIEW : STAFFORDSHIRE. [London : Jones & Co., 1830]. 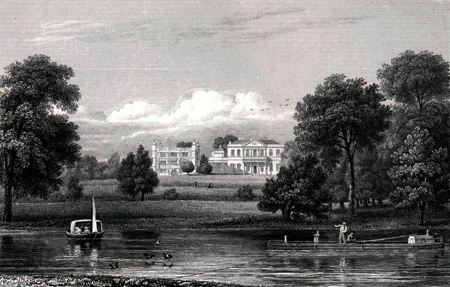 An attractive antique print – a view from the water of Trentham Hall, then the seat of George Granville Leveson Gower, Marquis of Stafford. 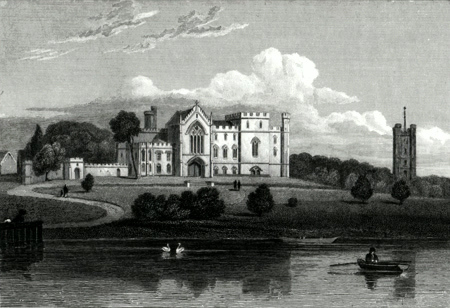 Engraved by Samuel Lacey (1786-1859) from an original study by John Preston Neale. Originally produced for the part-work “Views of the Seats, Mansions, Castles, etc. of Noblemen and Gentlemen in England” (London : 1829-1831). Steel line engraving on paper. Engraved surface 99 x 127mm (approx. 3-7/8” x 5”). In very good and clean state. A guaranteed genuine antique print. 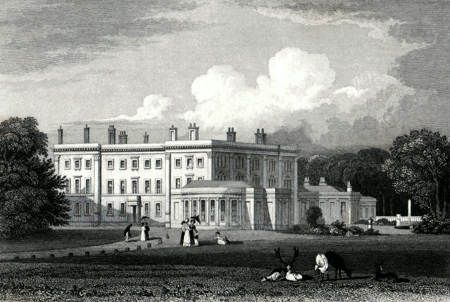 NEALE, John Preston, 1780-1847 : TRENTHAM HALL. STAFFORDSHIRE. London : Jones & Co., 1830. 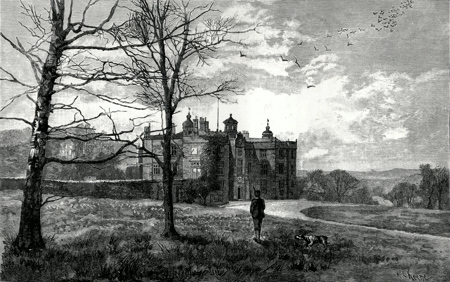 A handsome antique print – a view of Trentham Hall, deer in the foreground. 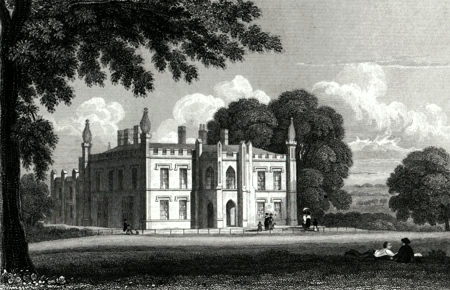 Engraved by Samuel Lacey (1786-1859) from an original study by John Preston Neale. Originally produced for the part-work “Views of the Seats, Mansions, Castles, etc. of Noblemen and Gentlemen in England” (London : 1829-1831). Steel line engraving on paper. Engraved surface 98 x 128mm (approx. 3-7/8” x 5”). In very good and clean state. A guaranteed genuine antique print. NEALE, John Preston, 1780-1847 : WOLSELEY HALL, STAFFORDSHIRE. London : Jones & Co., 1830. A pleasant antique print – the no longer extant Wolseley Hall near Rugeley. 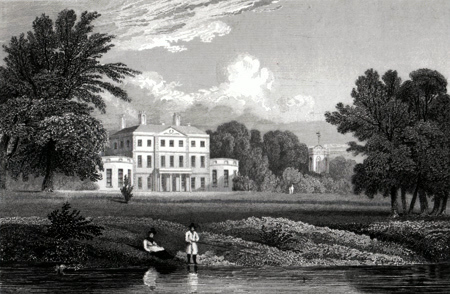 Engraved by William Radclyffe (1783-1855) from an original study by John Preston Neale. Originally produced for the part-work “Views of the Seats, Mansions, Castles, etc. of Noblemen and Gentlemen in England” (London : 1829-1831). Line engraving on paper. Engraved surface 97 x 124mm (approx. 3-3/4” x 4-7/8”). In very good and clean state. A guaranteed genuine antique print. PARKES, David, 1763-1833 : BOSCOBEL HOUSE, STAFFORDSHIRE. London : J. Walker, 1800. A charming antique print – the still-unrestored Boscobel House, on the Shropshire-Staffordshire borders – a view from the paddock . Engraved by John Walker (fl.1784-1802) from an original drawing by the Shropshire artist, David Parkes. Originally produced for Walker’s “The Copper-Plate Magazine, or Monthly Cabinet of Picturesque Prints” (London : 1792-1802). Copper line engraving on paper. Engraved surface 124 x 166mm (approx. 4-7/8” x 6-1/2”). A few slight marks to outer blank margins, but overall in very good and clean state. A guaranteed genuine antique print. SHEPHERD, Thomas Hosmer, 1793-1864 : DRAYTON MANOR : STAFFORDSHIRE : THE SEAT OF SIR ROBERT PEEL. VISITED BY HER MAJESTY QUEEN VICTORIA & H. R. H. PRINCE ALBERT NOV.R 1843. [London : L. Tallis, ca.1850]. An attractive antique print – a view from the gardens of the manor built for the Peel family by Robert Smirke – visitors on the path. Engraved by Henry Winsor Bond (1804-1881) from an original study by Thomas Hosmer Shepherd. Originally produced for Thomas Dugdale’s part-work survey published as “The Curiosities of Great Britain” or “England Delineated” in various formats between 1838 and 1860. Steel line engraving on paper. Engraved surface 100 x 138mm (approx. 4” x 5-1/2”). In very good and clean state. A guaranteed genuine antique print. SHEPHERD, Thomas Hosmer, 1793-1864 : LICHFIELD CATHEDRAL. VIEW FROM THE NORTH TRANSEPT. [London : 1842]. A pleasant antique print – an elegantly engraved interior. Engraved by Benjamin Winkles (1805-1856) from an original study by Thomas Hosmer Shepherd. Originally produced for the part-work publication “Winkles’s Architectural and Picturesque Illustrations of the Cathedral Churches of England and Wales” (London : 1835-1842). Steel line engraving on paper. Engraved surface 156 x 102mm (approx. 6-1/8” x 4”). In very good and clean state. A guaranteed genuine antique map.